So today was the last day of field school and it was a very exciting day! 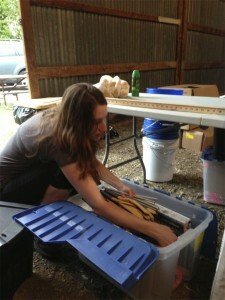 We worked until noon, trying our hardest to complete all the things that needed to be done. We prepared our pits for backfilling also. Part of that was placing poker chips with “Aztalan 2013” on them so that if a future excavation comes across our units they will know who did it. The Wisconsin DNR helped us backfill all the units with a bulldozer which significantly decreased the amount of time it would have taken us to backfill the pits by shoveling. 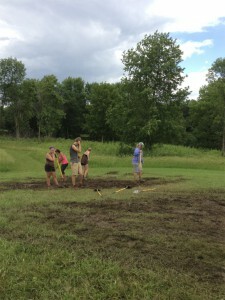 There was a storm before they got there so all the soil was very wet and difficult to move. All of us were wet and cold but armed with our shovels and rakes, we followed the bulldozer around from pit to pit, stomping in holes, leveling the ground, and raking it prepare for seeding. We had to fill a total of sixteen units, some of which were connected to others. The deep pits that we have been digging for five weeks are now pretty much gone, all that is left are square shaped patches that lack grass. 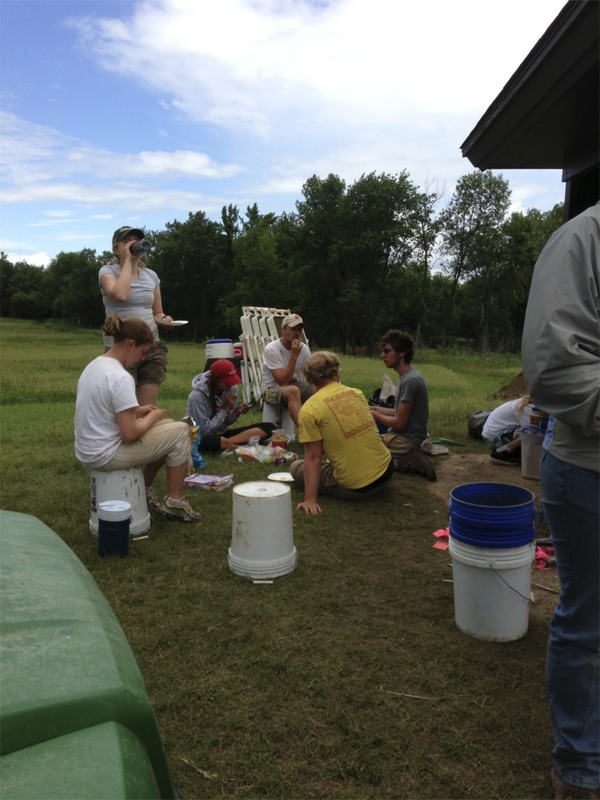 The next step to wrapping up the excavation was cleaning all the equipment, a couple of the students had to take the shovels and buckets in to town to wash them, the rest of us stayed back at camp to clean and sort what we could. My job was to clean the rust off of the files we use to sharpen our trowels. When the equipment came back we loaded everything up in the U-Haul and besides our own personal packing we are ready to go! Overall, the clean up day was really fun, everyone’s spirits were high knowing we would be sleeping in our own beds very soon. This was a great experience that I will never forget! This entry was posted in Uncategorized on July 2, 2013 by Ashley Smith. 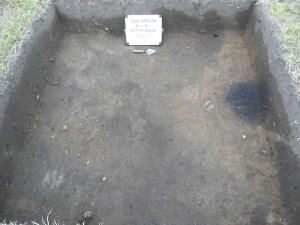 My second excavation pit, Unit 6, is located on the Gravel Knoll. 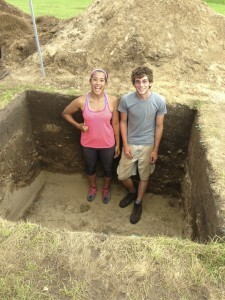 My pit partner, Ariel Williams, and I began excavating on Thursday, June 13th. In our first 10 cm level, we encountered gravel, broken shell, small animal bones, and small pottery sherds. Our second level was filled with many more diagnostic artifacts, including a Mississippian pottery rim sherd. We also discovered fire-cracked rock, flakes, grit tempered pottery sherds, and animal bones. Level three included a find that I found most exciting, a broken piece of a Mississippian blade!! The third level also revealed a dark circular soil stain extending out of the north wall. We excavated the soil stain separately, but only found three small chert flakes. Level four revealed eight possible post molds. 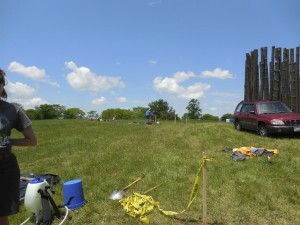 Six of the post molds were located in a semi-circle, extending out of the west wall. The post molds are still visible at the base of the fifth level. This could suggest that they were a part of a building structure on top of the gravel knoll. 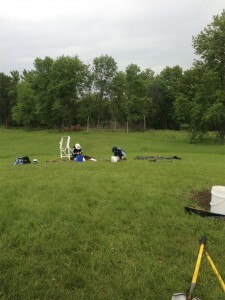 I am excited to see what the following levels will reveal in my unit in the final days of excavation! This entry was posted in Uncategorized on July 2, 2013 by Autumn Painter. For the first half of this field school, it seemed as though my excavation unit was the least captivating of the excavation units on the gravel knoll. 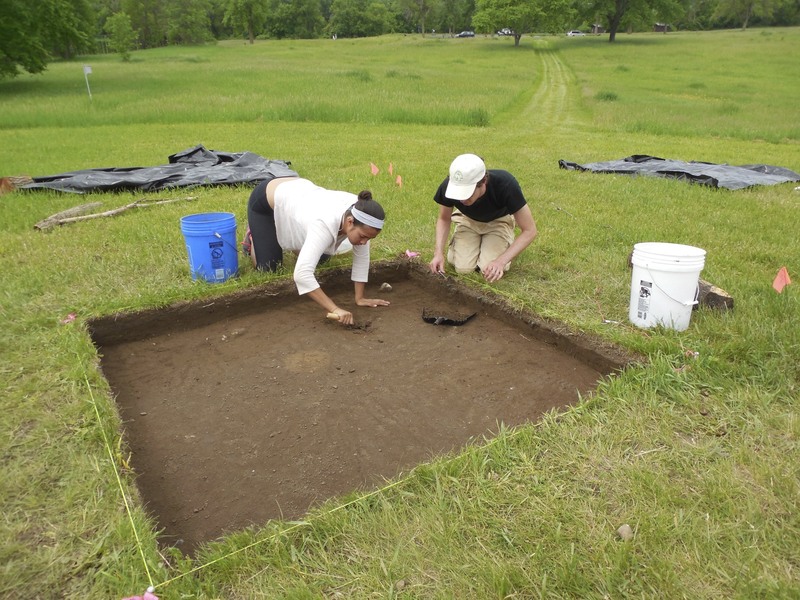 Sure, my excavation partner and I had been finding interesting objects in our unit, and we were excited about what we were finding, but the objects we had been finding seemed insignificant in relation to the arrow heads those in other units had been finding. Although my excavation partner and I were disheartened, we knew it was only a matter of time before our unit became more interesting. When my partner and I first noticed the dark gravel oval on our excavation unit floor, we were unsure what to make of it. We were told that it was a possible feature and that we needed to perform a cross section of it to be sure. A cross-section involves digging one half of a feature to see its soil profile in order to better understand the feature. We began our cross-section, and almost immediately found multiple pieces of animal bone. As we continued to dig down into our feature, we unearthed more animal bone, many pieces of charcoal, pieces of shell, and pottery sherds. It was not until completing the cross-section and chatting with the director of this field school, Dr. Goldstein, that we determined what this evidence meant. The charcoal pieces we encountered in the feature lend to evidence for burning, and the pieces of animal bone and shell are evidence for subsistence. With these pieces of evidence together, we were able to conclude that our feature was a cooking pit used by the Native Americans who occupied the site. One of the goals behind digging at the gravel knoll was to determine whether or not the Native Americans who lived in Aztalan altered the gravel knoll. Our excavation unit has now become more important because of the evidence it contains, that the Native Americans who lived in Aztalan modified the gravel knoll. This entry was posted in Uncategorized on July 2, 2013 by Emily Horbatch. These past few days, my pit partner Neill and I have been attempting to fix the walls of our unit. The walls should be as close to straight and vertical one can cut them, so the unit stays the same size all the way down. We are reaching the end of level five, and have been attempting to fix our walls before we go on. Walls are supposed to be as close to vertical as you can get them, so when you stand straddling the wall, you should not be able to see it at all. Our walls had steadily crept inward as we were digging down, so we had to cut off a lot to make them vertical. As we have a square, Neill and I will both do two walls. I fixed the eastern wall and will fix the southern wall, and he fixed the western wall and will fix the northern wall. The western wall was difficult to fix, which is why it was the worst. That is the wall where we have a twenty-five centimeter balk between our unit and Unit 2. For now, we are leaving the balk up to separate the units, but we will take it down before we leave. The balk is fragile, so one cannot put their weight on it; meaning that to fix the wall, one has to balance so you can look straight down, but not put any weight on the wall. I was grateful to Neill for offering to fix that wall. We still have to screen the dirt we take off the walls, so we have been moving slowly. However, we have found a few sherds of pottery and some shell from the walls. Luckily, there has not been anything of great importance, so we don’t have to worry about lost elevation and other contextual information. If we had found a diagnostic artifact, such as a rim sherd, we would have to worry more about what elevation it came from. A diagnostic artifact is an artifact that is indicative of the period it is from, such as a projectile point. Projectile points have distinctive characteristics that define what time period they are from and are exclusive to that time period, so one can date them easier than a flake or sherd that lacks distinctive qualities. We have made fair progress on our wall, each of us fixing one on Sunday. I believe we will finish the walls and move on to level six tomorrow! Now that we know what our walls should look like, we will be able to keep them straight for the coming levels. This entry was posted in Uncategorized on July 2, 2013 by hallmeg3. Aztalan State Park is a very interesting place. My field experience here began at the Gravel Knoll on the East side of the site, closest to the Crawfish River. My unit over there produced plenty of interesting finds, including points, flakes, pottery sherds, shell, and animal bone. The soil was also varied and everyday in the unit was something new and exciting! Just this last week I was moved to the West of Palisade excavations to open a unit that hopefully will bisect the western palisade wall and possibly a previous excavation done by Barrett. I must say that excavating in this area is not for the faint of heart. The soil is a hard packed clay that is very hard to dig through, my muscles, most days tell me I just need to stop. This unit also is very low in artifact and debris density. We may go hours before finding a tiny flake. That is not to say that we are not finding anything, in fact, we have found some rather large pottery sherds with a very course grit temper, and some Aztalan brick. The most exciting sherd, at least for me was a rolled handle pot top. There was this sense of awe as we pulled it out of the ground as it was something that I had never seen before. 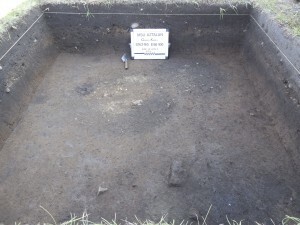 However, things besides artifacts are being found and provide information from this unit. We found a concentration of postmolds near the center of our 1×4 unit that coincides with a low trench in the ground. These were relatively hard to see as the soil discoloration was very subtle. The middle postmold that was excavated seemed to have been purposely filled as it contained a concentration of fired granite and some sherds. There was also a concentration of burned clay and charcoal in this unit, which is much smaller in diameter than the other postmolds. This particular feature may end up being a taproot of a tree that burned. This thought is due to the size of the featuire, the lack of artifacts within it, and also its location compared to the palisade. While I don’t find this to be as exciting as finding projectile points, it still provides priceless information that we will not be able to study again. It’s hard to imagine that the field school is almost over, as it seems like I’ve finally just settled into the routine. My and Kyla’s excavation unit started with Kyla and I uprooting sod, and using the sharp edge of our spades to smash through the thick plastic mesh just beneath it. Today though, when the work day ended I realized that I could no longer just step out of our pit any more. It had been a stretch for a while, but now it seems the only way out is to get a running start (as much as one can in a 2×2 meter pit) and then jump for it. The one alternative is a method commonly referred to as the ‘beached whale method’ which involves the archaeologist jumping up the wall and landing with their stomach on the above ground, such that they are bent over the wall of the pit like an inverted ‘L’. They must then swing their feet upwards and roll over onto the grass. Needless to say, the ever decreasing ease of entering and exiting the pit has made me really start to rethink what is a worthwhile reason to leave once I’m inside. Where as I once kept by backpack, water, and tools strewn randomly across the nearby grass, I now keep them within easy arms reach of the pit. Depth has also brought about the occasional disheartening realization that I have left something important behind, or just out of arms length, immediately after entering the pit. Even the dynamic of such other important activities such as our 10:00am cookie break has shifted. Normally, cookies are set out in the central information kiosk (which our units roughly surround) around 10:00, as a good way to get us to mingle and look at what is going on in our pit neighbors’ units, yet today was the first day that they were brought over to us to let us avoid having to leave our squares. ‘Pit yoga’ as it has come to be called has also begun to change and adapt to the ever deepening excavation squares. The practice of pit yoga, first invented by Kyla Cools is the method of laying down and suspending one’s self over the side of the pit. When it comes time to trowel the floor of the unit, to ensure that the surface is even and at the proper elevation, as well as to make any variation in soil color or texture more visible, the excavators must ensure not to step on an area that they have previously troweled clean. At higher levels, it was easy enough to simply kneel down and trowel the floor from the edge of the unit. As we have gotten deeper however, it became necessary to lay down and suspend one’s self over the edge of the pit, leaving one’s legs on the grass while they reached down into the unit to trowel the floor, and thus the practice of ‘pit yoga’ was born. More recently though, as our pit has passed the one meter mark for depth, it has become increasingly impossible to reach the bottom even while suspending ourselves over the pit. Thus pit yoga has become something more similar to ‘pit handstands.’ as we support ourselves with one hand while troweling with the other. On the bright side of depth however is the fact that as we continue to go deeper and deeper, there is an ever-widening area of shade inside of our unit. The heat, especially towards the end of the day can be oppressive, yet as we’ve gotten deeper the walls of our unit have begun to provide us with a nice band of shade towards the end of the day that helps us to cool off. So while depth can be both a good and bad thing, it always has the tendency to make things a lot more interesting. This entry was posted in Uncategorized on July 2, 2013 by harri938. 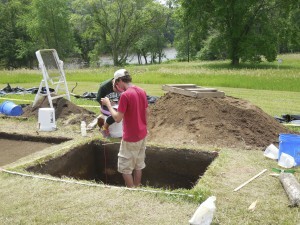 The archaeological excavation in Aztalan State Park started off slowly. I was assigned to a unit west of the main palisade. My unit partner, Neal, and myself uncovered several flakes and pottery sherds. 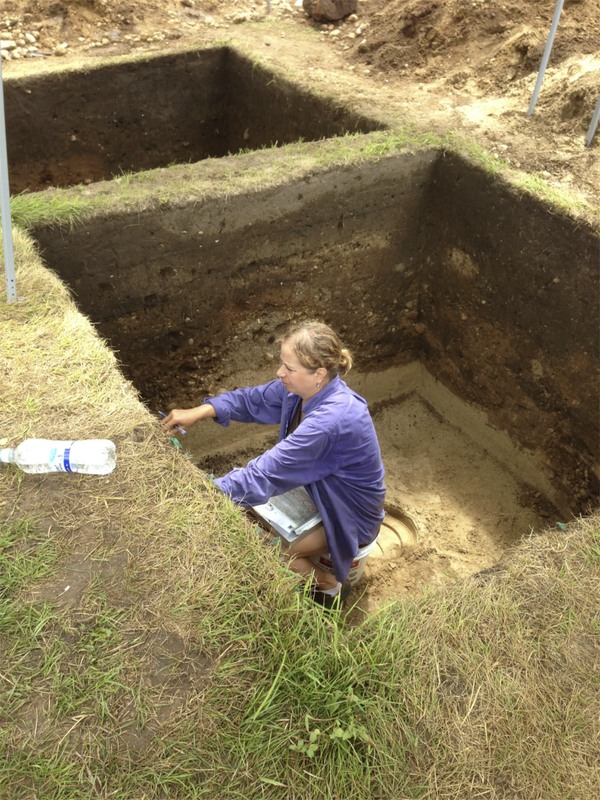 The soil that we excavated was very dense and mostly clay. 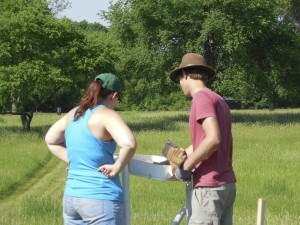 It made it difficult to screen the soil to look for artifacts. The main feature of our unit was a deep plow scar through the center of the unit. 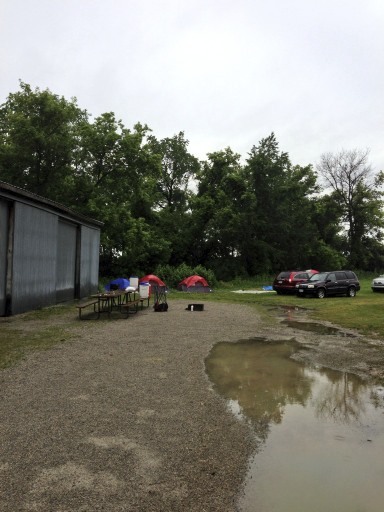 On one occasion, we had bail out the tarp covering our unit after a thunderstorm. After Neal and I finished excavating our unit, we moved over to excavate on the other side of the park, the gravel knoll. In my new unit with Ariel, we have uncovered animal bone, shell, flakes, pottery sherds (both shell and grit tempered! 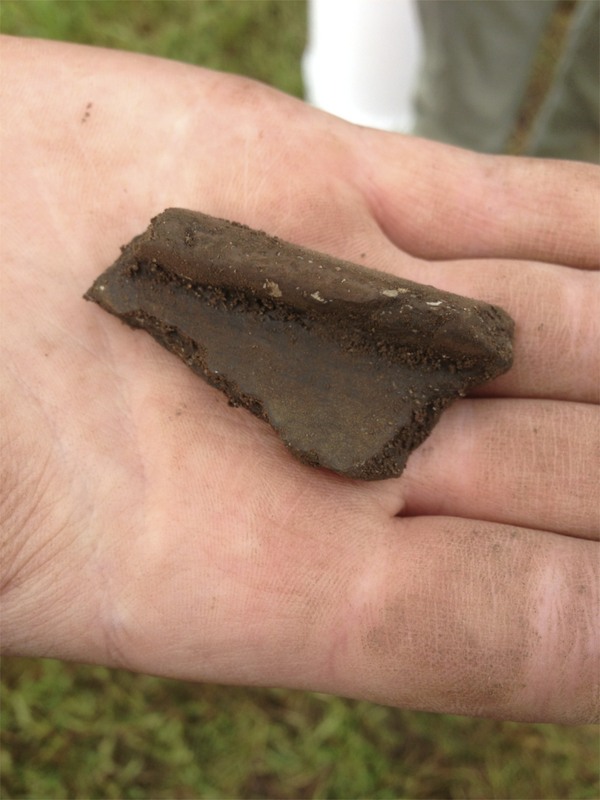 ), a beautiful shell tempered rim sherd, and a portion of a Mississippian blade! I am very excited to see what we uncover next! I have never been camping for such an extended period of time. The only time I have ever slept in a tent was when I was very young, and my siblings and I convinced my parents to set up a tent for us in the backyard to sleep for the night. During the middle of the night we grew tired of the cold, and went back into the house to sleep in our warm bedrooms. So, needless to say, I was worried about sleeping in a tent for five weeks as part of this archaeological field school. In addition to the camping supplies list I was given, I attempted to think of every other item I would need in order to live as comfortably as I possibly could in my tent. I traveled to Cabela’s, a camping/hunting supply store, where I thoroughly surveyed the store to make sure I had not forgotten any necessary supplies. There, I bought items such as a tent, a cot with storage compartments, a battery-operated fan, and a remote controlled lantern. After my trip to Cabela’s, I felt fully prepared to live in my tent for five weeks. The weekend before the field school, my parents and I loaded up the car with my camping supplies, and had just enough room for everything to fit. When we arrived on the day of the beginning of the field school, with my parents help, I was able to set up my tent in what seemed like record time. 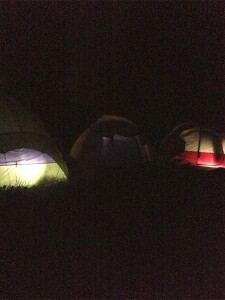 We aligned my tent with the tents of the other field school participants. I organized my tent in such a way that I have enough space to comfortably move, placing my cot on one side of the tent, my suitcase full of clothes and hamper on another, and my drying rack and chair on the other side of the tent. 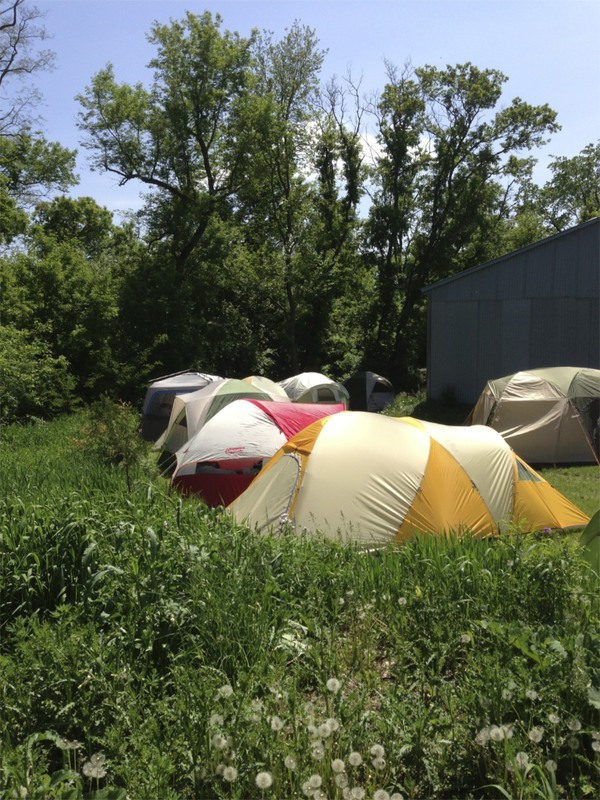 For the past few weeks, I have been able to experience what life is like living in a tent. Although we do not have access to many of the amenities of home life, we do have substitutes for them. Instead of running water, we are able to access a hose, where we are able to fill up our water coolers every day. Instead of the lamps and lights of home life, we have lanterns in our tents, which work just as well. Instead of the private showers of home life, we are able to access a public shower every day. 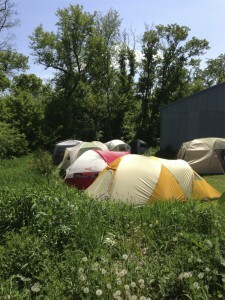 Although these may seem like drastic changes to some, I have found it easy to adjust to tent life. Besides the wet spot that continues to develop on my tent floor, even though I bought a ground cloth to put underneath my tent to protect from water seepage, I have encountered few problems with tent life. My cot is surprisingly comfortable, and so I am able to sleep throughout the entire night without waking up. My sleeping bag is designed to work for temperatures as low as 30 degrees Fahrenheit, and so I am able to keep warm during the cold nights we have experienced. I enjoy waking up to the sounds of the birds chirping outside my tent. I have very much enjoyed the past few weeks I have spent living outdoors as part of this archaeological field school, and look forward to the next couple of weeks. Tuesday, I worked in the lab washing artifacts for the first time. The three of us, Caroline, Ashley, and I, washed the bags of artifacts we had collected previously. We had four main types of artifacts to wash: bone, shell, pottery, and rock. 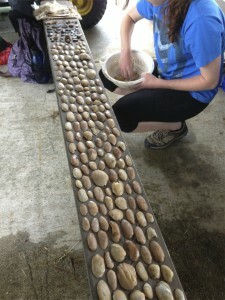 I have previous experience washing bone, but I have never washed shell, pottery, or rock artifacts before. We use different methods of washing for each type of artifact to ensure the least damage. For rock artifacts, which include flakes, arrowheads, and fire cracked rock, we submerged the artifacts in water and scrubbed them clean with a toothbrush. For bone, we dry brushed most fragments, using a small amount of water on bone that was particularly dirty. We brushed shell artifacts with a soft, dry toothbrush, as they crumble easily. Pottery sherds, which are fragments of pottery, we washed by wetting a finger and wiping as much dirt as possible off. This was a tricky method to use, but finger and brush marks can be left on pottery if one is not careful. Our washing stations included a plastic tub with about two inches of water in the bottom, a few colanders, and toothbrushes. I had a wet toothbrush I kept in the water for use on rock and bone, a dry toothbrush for bone, and a soft dry toothbrush for shell. Keeping the wet toothbrush separate from the dry toothbrush helped me with speed, so I would not have to wait for the brush to dry. Washing artifacts is extremely fun, as one can see what the artifacts look like without a skin of dirt. We had collected a few flakes of Hixton silicified sandstone in my unit that I washed today. This type of rock looks like sugar crystals and shines brilliantly in the sun once clean. Washing flakes of Hixton was my favorite artifact today, because they look so different once clean. Some flakes are clear, much like glass. It was also fun to see what other units had found. I even got to wash some of the arrowheads other units had found. However, washing can be extremely frustrating as well as rewarding. Units may have a bag full of tiny flakes or bone chips, which one must wash. This can be very tedious, especially when one is afraid of breaking artifacts, like me. Also, when I opened up some bags, larger artifacts had already been broken while in the bag. For example, in my unit we had found a rodent tooth of a pretty decent length. When I opened up the bag to wash our artifacts, the tooth had been broken in two. All in all, washing artifacts was a nice break from digging in my unit. I enjoyed learning how to properly wash the different types of artifacts, as well as seeing what the artifacts looked like once clean. It was sad to see the few artifacts that had been broken, but luckily that number was small. As odd as the title may seem, it feels all too appropriate as I sit here writing this. Right now being the first time I’ve been on the internet in almost two weeks, I realize that there really is no way to fully prepare for the lifestyle change that coming to this archaeology field school represented. I came in expecting to be roughing it in every sense of the word – camping in the middle of no-where with no electronics but digital watches, the situation I found however was quite different. My tent (among almost 20 others) is set up in a ring surrounding a DNR service shed large enough for them to store various tractors, equipment, and picnic tables for us to use. There is electricity in the shed, enough to power lights, a refrigerator (for our breakfasts of cereal and milk), and an additional power strip for everyone to plug in their phones and other electronics. To my surprise there is not only phone service, but also internet (sometimes) made possible by Dr. Goldstein’s satellite router. 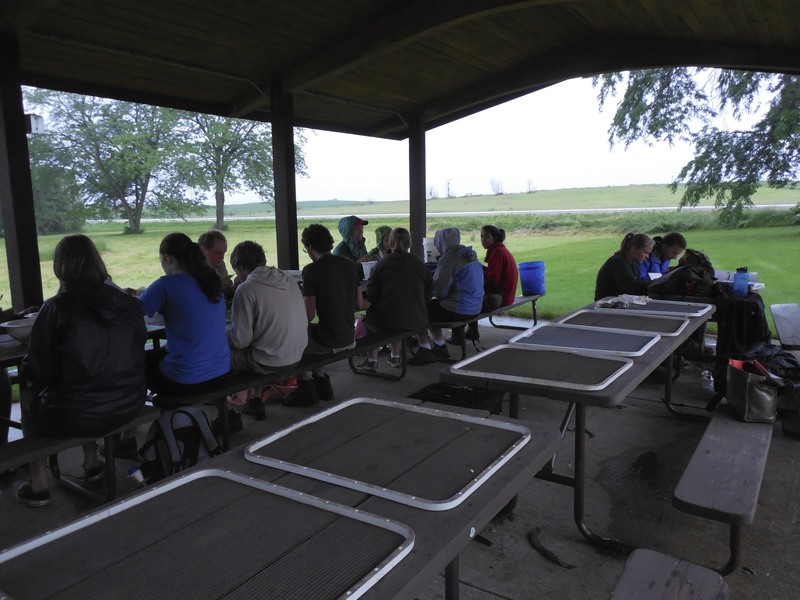 It is truly an odd combination to be sitting in an open shed at the mercy of the wind and weather, while at the same time sitting around others who are playing games on their phones and laptops. Our water used to come from a large metal hand pump, but the hard taste of the water prompted us to bring our water coolers into town and fill them up from a hose at the trail head building. There is an odd mix of civilization and wilderness that has made for an interesting adjustment. In many ways it feels as though I’ve left the world I came from, the world of electronics, internet, and civilization, while in many other ways it feels as though I’ve never left. It has definitely been an strange transition, but an interesting and worthwhile one nevertheless. We have many of the luxuries of civilization, but yet I feel that this lifestyle has left behind much of the stress of the civilized world. Me and many others have started to lose track of the days, with each one blending into next, but this a nice feeling, a tranquil feeling. It is a slower-paced lifestyle, one with hard work, as long days of digging in the hot sun can attest to, and great rewards, such as uncovering a strange relic of the past. Even looking back on my time here so far I am very glad I came, but have yet to fully decide which of the two worlds (if not both) that I find myself living in.